I started playing steel at age 15. From that age, through my 20’s I played with local Houston bands. I also played with Mercury artist Jeff Chance. Subsequent to that, I landed the steel seat with Curb recording artist David Kersh. I toured the 50 states, seeing most of the lower 48 at least twice in 4 years, and Hawaii as well. I also did numerous TV shows and the 1998 Reba/Brooks and Dunn tour with David, as well as the Grand Ole Opry. After leaving David, I came back to Texas and did a 5 yr. stint on a Variety show at the Lake Theater in Lake Jackson, TX as staff steel guitarist. After that, I started teaching and doing instructional DVDs, as well as playing with more traditional regional acts and doing sessions in the Houston area. I played with Johnny Bush, Johnny Lyon and Frenchy Burke during this period. Later, I joined my David Kersh alumni pal, Bobby Flores and his Yellow Rose Band. I played with Bobby for 4 years. During this period, I had the honor of working with many fine players and artists, including Bobby, Tony Booth, Darrell McCall, Curtis Potter and others. We toured Scotland, Switzerland, and did several Carribean cruises. I’ve also done shows with Amber Digby, Justin Trevino, and Leon Rausch. I did the RFD TV show “Tru Country” with Bobby as well. In 2008, I was voted “Steel Guitar Player of the Year” by the Texas Steel Guitar Association. I am currently playing steel for Texas artist Jeff Woolsey and the Dance Hall Kings, and I continue to teach and do instructional DVDs. I have done a series of DVDs called “C6 Voicings on E9”. 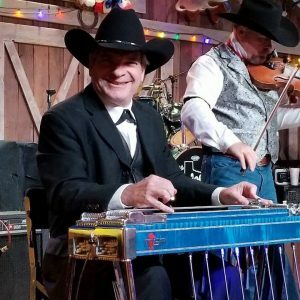 In 2017, I was inducted into the Texas Steel Guitar Hall of Fame. I am doing more teaching these days. I was steel guitar instructor at Bobby Flores’ Western Swing music camp in for 3 years, and will be again this year. 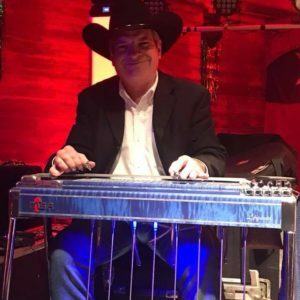 In addition to that, I have several private students and do seminars and schools of my own.I am currently working on a 3 day steel guitar school for October 2017 in Sweetwater, Texas. We did one last year and were very successful. I also did a seminar at the Phoenix steel guitar show in Jan 2017, and will be doing that again in 2018. I have a one day seminar scheduled for August 13, 2017 in San Antonio, TX.